It's been so long since I've blogged or baked anything from the Bread Bible. It's really hard to get back into the swing of things but I think I've just got to grasp the nettle, yank off the bandaid and get back on the horse etc, etc. 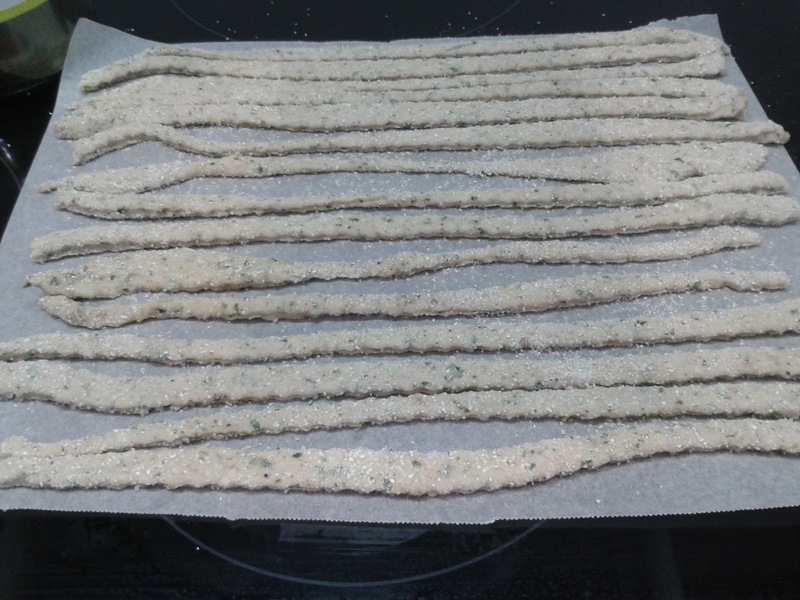 And what better way to start back than with some alien fingers, aka Spicy Herbed Breadsticks. It's so long ago I have almost no memory of making these although I do remember I had to make them in my toaster oven so they're a bit shorter then the recipe suggests. They were a bit fiddly (i.e. you have to roll them out and cut them up) which always tests my patience. 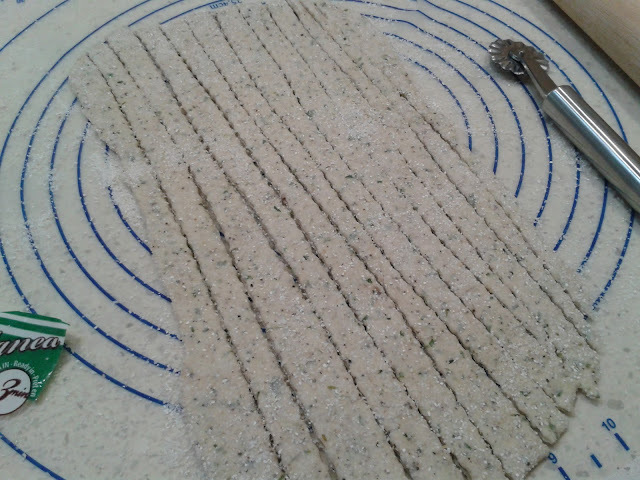 Also I used semolina to dust the bench when rolling them out and it was probably a bit too coarse (it was just what I had in the pantry). I'm not sure I did justice to the recipe but they were very crunchy and surprisingly spicy (Why a surprise, you ask, given the name? I think it was the degree of spiciness that I didn't expect.) 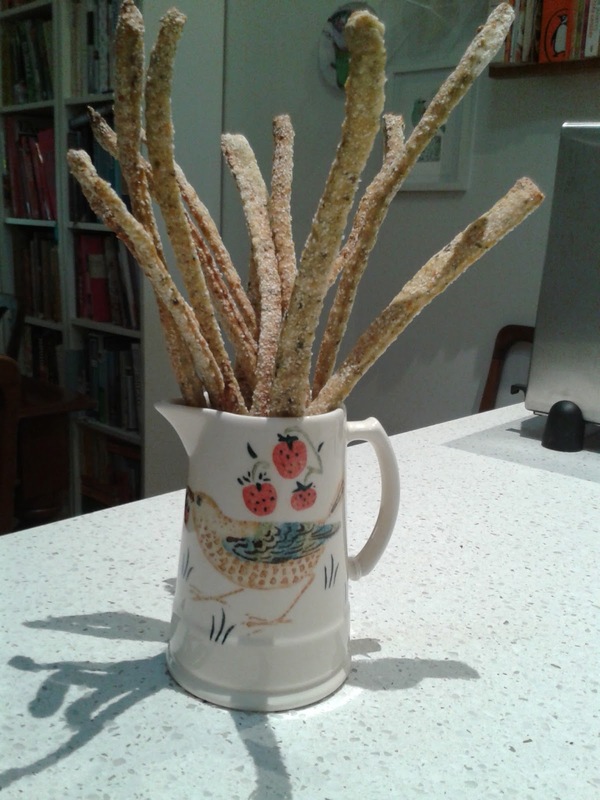 I don't think I'd make them again - if I'm having people over these days I prefer to buy this kind of thing and concentrate on making the main dishes myself. Next on the list to try is Mediterranean Matzoh. I like matzoh and I'm sure these would be tasty but they're not yeasty bread...which is precisely why I got stuck at this point in the Bread Bible bake-through list. I intended to skip them but found that difficult too and so here we are at an impasse. Obviously I need some sort of therapy but I think I'll just try and push through, so next up is not bread but cake - Cinnamon Crumb Surprise. My favourite type of cake (apart from all the other types which are also my favourite). See you soon. Well, here we are finally at the 2018 Bread Bible Bakers' schedule. Only a month behind now if you don't count the Banana Feather Bread I still have to make from the 2017 schedule. I'm not counting it. The January bread is the Traditional Challah. We made challah early in this bake-through but for the first challah we used the recipe from Rose's website at her suggestion. The first recipe uses a biga which sits for three days in the fridge and, since I didn't need it to be pareve, I used butter rather than oil. 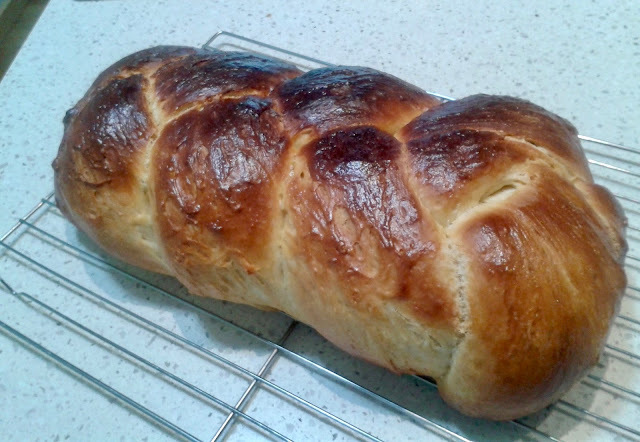 Although it was quite some time ago that I made the first challah, I still remember how soft and moist it was. 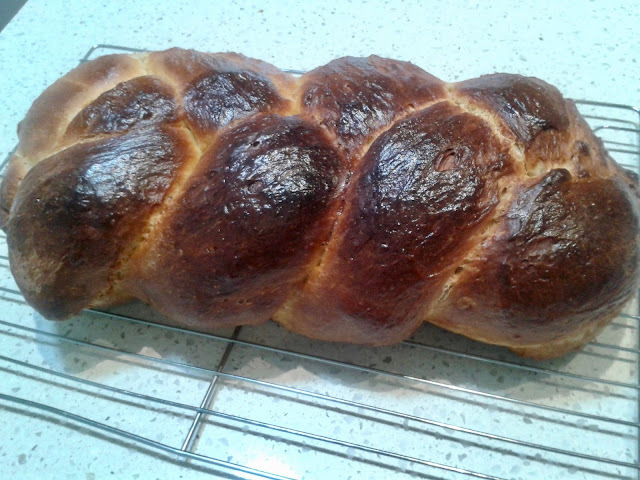 The second challah did not compare as favourably. 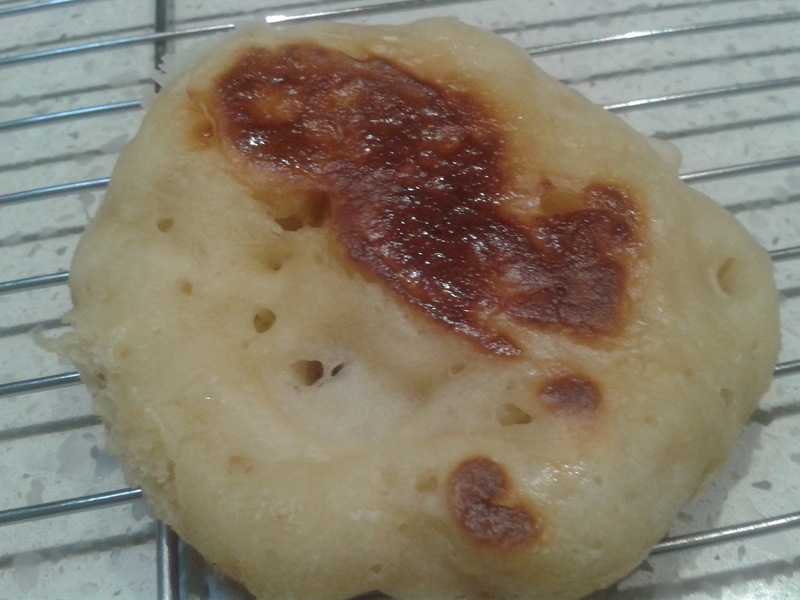 Although it was quite soft and had a lovely flavour, it didn't have that brioche-type softness of the first. I have to say, this didn't stop one of my colleagues commenting on the delicious smell as I toasted a piece for second breakfast one morning. Rose suggested we use the website recipe specifically because it was 'new and improved' on the Bread Bible recipe. However I suspect that the use of butter instead of oil would also make a difference to the Bread Bible recipe. Since I had already tried out the four strand challah shape I made a slightly smaller three strand loaf and a one strand loaf. The four strand is more spectacular but the three strand is pretty good. I had to fit it in my toaster oven so it doesn't have the desired tapering at the ends. I forgot to take a photo of the one strand loaf. I really like this shaping method - it was satisfying in the way that cleverly designed packaging is (or maybe that's just me). I also forgot to keep on eye on the larger loaf and just caught it before it went from burnished umber to undeniably burnt. One thing I'm wondering, after my two attempts at challah, is why I get those striations on the dough - they happen when I'm rolling out the strands of dough before I plait them. Perhaps I'll go and google it. The February bread is Spicy Herbed Breadsticks which I hope I get done before the end of March :) You can have a look at how the other bakers went over here. 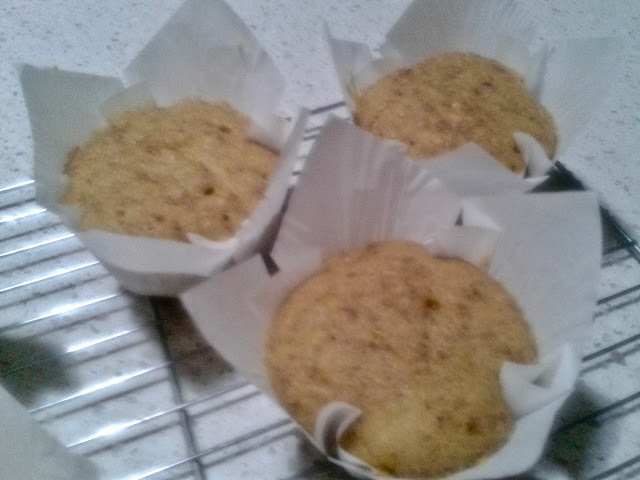 You'd be forgiven for thinking that I took this photo as I drove past these banana muffins at high speed. Instead it was taken in haste with my ancient phone camera because my iPad battery had died (as in completely dead, not run down). They also might have looked better if I hadn't had to microwave them. Yes, you heard, I said microwave. I realised my oven had died as I waited in vain for the muffins to cook. And that was my back-up convection microwave oven. My actual oven has not worked for some time. I think I can safely recommend these, although mine were a little spongy from the microwaving, they were very tasty and easy to make. My only comment on the recipe would be that it makes 5 (admittedly large) muffins which doesn't seem worth getting the bowls out, for so I'd recommend doubling it. Not one to be deterred from sweet goods by the mere lack of an oven, and having bought all the ingredients and promised my colleagues a Nutella Cake for World Nutella Day, I toddled off to retrieve my toaster oven out of storage. And since I had the oven and all the ingredients for Angel Light Biscuits, I thought I'd knock them off my Bread Bible Bakers 'to-do' list as well. 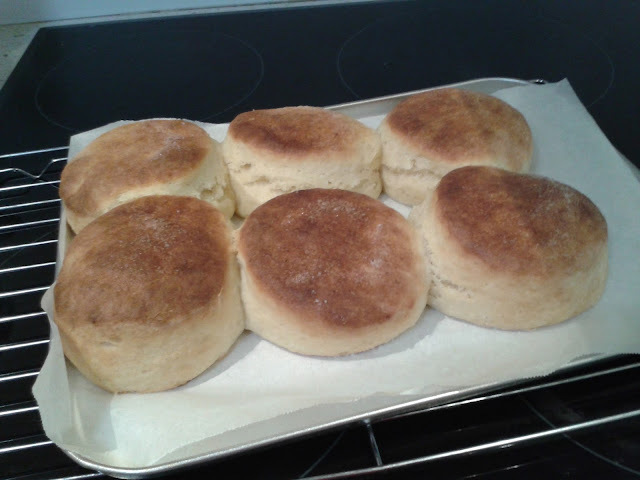 All the way through making these Angel Light Biscuits I was thinking (grumpily) that the efforts the baker has to go to in this recipe for what are essentially scones (or biscuits in US parlance) is a bit over the top. Then I ate one, and then another one, and pretty soon I was thinking about when I could make some more. They do defy categorisation, to my mind, but their soft texture and yeasty flavour made me think of traditional Northern English or Irish yeast breads. Or even brioche, at a stretch. One of the interesting things about this recipe is that it includes yeast as well as quite a lot of baking powder. I thought they'd burst out of the oven with all that rising agent but they were fine. 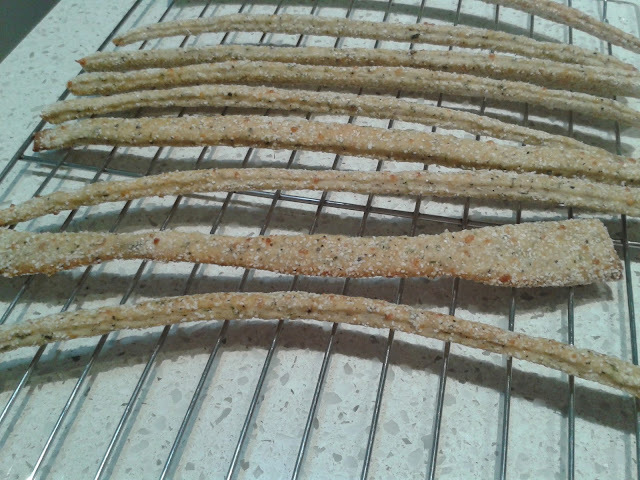 Plus there's the very curious addition of hard boiled egg yolks strained into little worms and mixed into the flour. I've only ever done that kind of thing for a savoury salsa or dressing. You don't notice the egg yolks at all in the finished product, so there's no danger of coming across lumps of egg yolk in your scone. 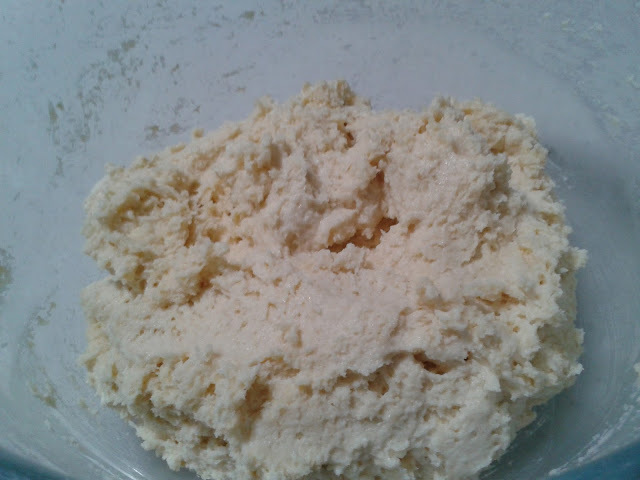 The dough starts off very wet before it is left to rise, refrigerated, then shaped and risen again. I was particularly annoyed by this lengthy part of the recipe, but I think the key is not to make them when you're feeling hungry. I may have cut a few corners during this process and suspect I could have got more height in my scones if I'd been more patient. I used all buttermilk in my scones, rather than the cream option, and I guess that contributed to the very soft texture and lovely flavour. 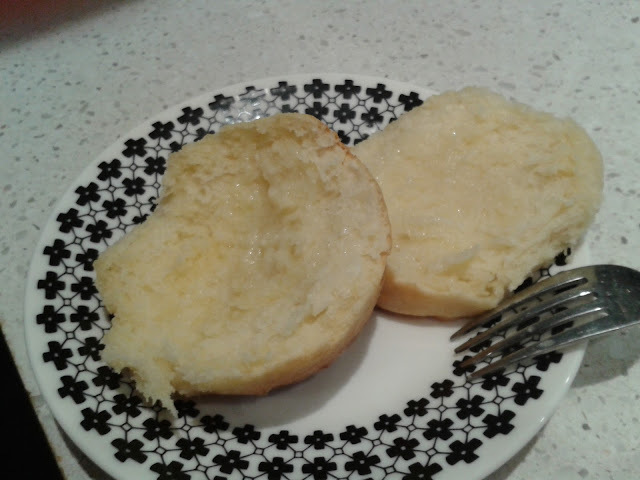 Because the butter is rubbed into the flour like traditional scones, they also had the light, layered texture of scones. I recommend the optional sprinkling of sugar on the tops, to make a sweet crust. Keep on eye on the other Bread Bible Bakers' progress over here. I'm putting this up for posterity only because I remember almost nothing about making this bread at the end of last year. I also only have photos of the finished product so there are no clues there either. What I do remember was that my loaf wasn't potato flavoured in the way I expected it to be. 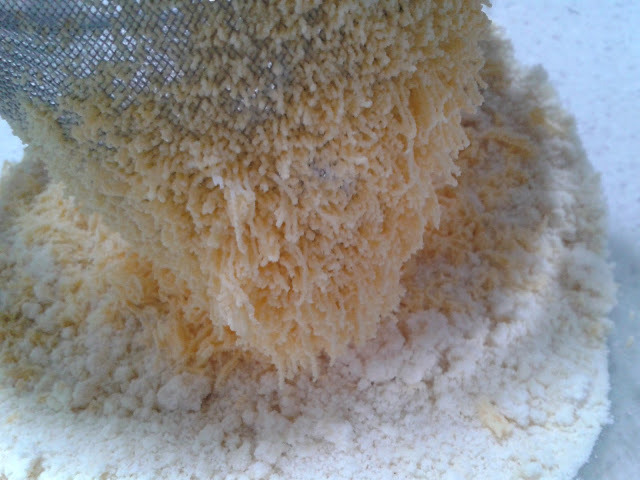 There is a very small amount of potato flour in proportion to the bread flour in the recipe. I haven't researched potato flour in the US but perhaps it's different to the flour in Australia. I've made a pastry using mashed potato mix (the old Deb variety of school camp nightmares) for a Scandinavian savoury Christmas pie from this book which was absolutely delicious and potato-ey so perhaps that was what I was expecting. Anyway it made quite a nice looking loaf. I'm still in catch up mode for the Bread Bible Bakers and I've temporarily skipped a couple of things I've made previously but I'll come back to them (because who could resist another excuse to make the delightful Banana Feather Loaf?). Check out how the other Bread Bible Bakers went with their baking over here. Where's the cream cheese icing? the ingrates at work whinged. It's Carrot BREAD, I retorted, NOT cake, so NO icing. Well they're my rules anyway and I'm sticking to them. Rose does mention the possibility of icing in the recipe but really it doesn't need it. Even my workmates had to concede this is a highly moist and delicious bread. This quick bread has a lot of carrot in it which is my only complaint. Not the carrot itself (which I love) but the grating, which I did manually. Until you try it you don't realise how much carrot flings itself around when you grate it. I had it stuck to everything including the laptop - which makes a change from the usual liberal dusting of flour (the screen now has a very grainy feel to it). Not to mention the film of grease over the iPad screen from oil spray drift. This recipe is definitely quick and easy. Basically you mix the wet and dry ingredients separately and then in together, then add the carrot and sultanas. I didn't have turbinado sugar (I never have turbinado) so I substituted light brown sugar. Then I didn't have enough of that so I substituted dark brown sugar as well. So you can see my cake is a bit darker than it might otherwise have been. *I might not have taken it at all if I'd know those scurvy sea dogs were going to complain. I've skipped the Potato Bread which is on the Bread Bible Bakers schedule (possibly for sometime back in July) but I'll be back to that in the next post. The next offering for the Bread Bible Bakers (yes, I am behind schedule still) is the Alsatian Onion Pizza. Alsatian brings to mind the dog breed but I can assure you there are definitely no dogs in this pizza. In the recipe Rose states that the pizza dough recipe makes enough for two people. I don't know if she's feeding pigeon-sized people but I beg to differ on this point. Maybe I just know a lot of greedy, greedy people. Anyway the point is I suggest you double if not quadruple the dough recipe if you want to satisfy family and friends, and/or are shamelessly greedy yourself. I doubled the dough recipe but not the topping. The onion* and gruyere cheese topping is quite sophisticated as pizzas go. While I do love the old favourite pizza toppings (hello ham and pineapple) it's perhaps good to have another topping up your sleeve to serve to your more discerning friends and family (if you have any). I felt positively cosmopolitan scarfing down multiple pieces standing over the kitchen bench. *Still mulling over the Alsatian part of the pizza, am wondering if onions are particularly grown in that region? Although it's more likely the gruyere cheese? There's nothing like a blog to expose your ignorance. The dough is very simple to make. If you're a bread baker you might describe it as quick, although I'm not sure a random street poll would agree. Having cooked through one of Rose's books I find my judgement on designations such as 'quick' and 'easy' is slightly skewed. The dough takes a bit of time because of the proving phases but really the initial mixing couldn't be simpler. You mix a few basic ingredients roughly together and leave it in the bowl in a good amount of olive oil for an hour, or overnight in the fridge. When you next see the dough it's more beautiful swan than the ugly duckling you left in the bowl and it's very easy to to shape and prove a couple of times until it's ready for baking. The topping involves slowly cooking some onions down until they're caramelised. It thought it was a little bit (more) involved (than I have patience for) for caramelised onions but the result was lovely. The thyme and garlic added towards the end, nicely offset the sweetness of the onions. Once I had my pizza bases and toppings lined up, I got out my miracle pizza cooker (not its official name). It was a present from my older brother and sister-in-law (thanks again J & M) and, like a lot of cooking equipment, is both a blessing and a curse (take the bench top deep fryer, for example, just how easy do you want it to be to deep fry something at a moments notice?). The 'blessing' part of the pizza maker is the high heat it can generate and the pizza stone base which cooks bases to perfection in double-quick time (my favourite type of time). Rose has us cook the dough base for a short while before putting the toppings on and baking again. This worked well, particularly with the pizza maker, because I could cook the base on the tray and then once it was par-cooked I could finish it directly on the stone base of the pizza maker, with the toppings. The pizza was exactly how I like it - a thinnish, crispy and chewy base with just enough topping to flavour the base without drowning it. Even though I doubled the dough but not the onion mixture, I found there was plenty to cover the two 25cm-ish pizzas. The sweetish onion mixture and the nutty gruyere cheese is a great combination. This pizza is way too easy to make. It's a public holiday here in the Northern Territory as I write* and I'm very tempted to mix up some dough and treat myself. Perhaps a tomato sauce base this time. The next recipe on the Bread Bible Baker schedule is Potato Buttermilk Bread. *Actually by the time I got around to pressing the publish button on this blog post the holiday was long gone. But I did make some more pizzas that weekend and they were just as, if not more, delicious than my first attempt.